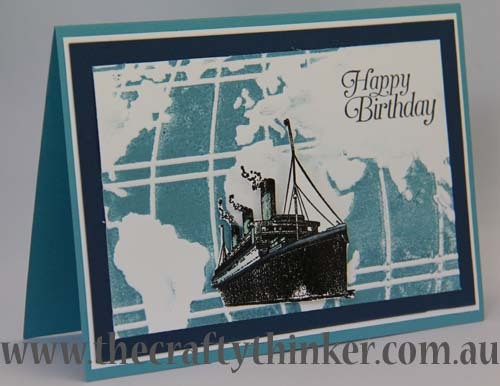 The Crafty Thinker: Stephanie Fischer - Independent Stampin' Up Demonstrator: The Sky is the limit for World Traveler & Traveler! The Sky is the limit for World Traveler & Traveler! Today I was making more samples for my 9 week semester of classes (starting 2 February). 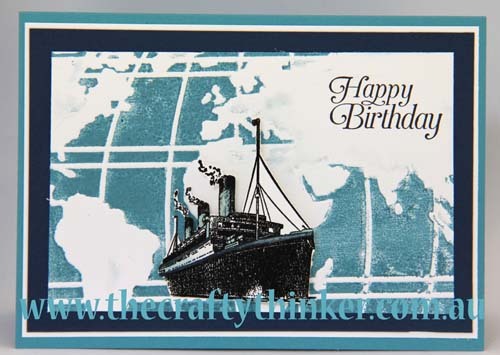 This card featuring the World Traveler embossing folder with the ship from the Traveler stamp set, is for the class about the Letterpress technique. 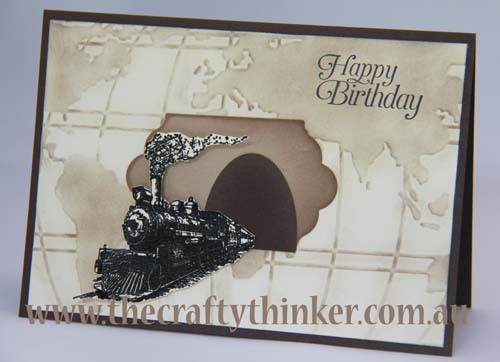 I liked the combination so much that I decided to pair the World Traveler embossing folder with some other modes of transport! Since the others were land-based,though, I decided to emphasise the land masses on the globe rather than the sea. 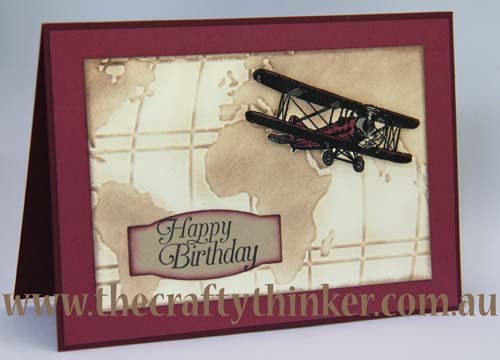 The birthday greeting on all of the cards is from the Sky Is The Limit stamp set which can't be purchased because it's one of the wonderful FREE products that are exclusive to Sale-A-Bration - for every $90 of product you buy, you can choose one FREE product from the Sale-A-Bration catalogue. The label for the greeting is cut with the Project Life Cards & Labels framelits. The aircraft is popped up on dimensionals as are the front of the ship and the front of the train. I like this embossing folder so much that I can forgive its geographical inaccuracy! You're welcome! Thank you for that very kind comment! What colors of card stock did you use on the airplane card? Very nice. thanks! I'm so sorry that I didn't spot your comment earlier! I used Blackberry Bliss, Rich Razzleberry & Very Vanilla cardstock. Thank you for asking.